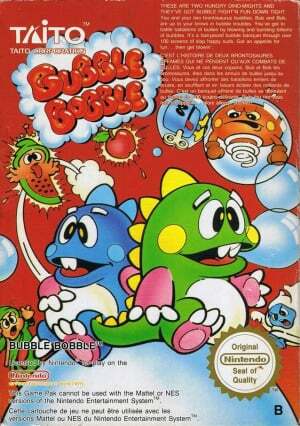 Bubble Bobble is a puzzle-action game featuring the two Bubble Dragons, Bub and Bob. 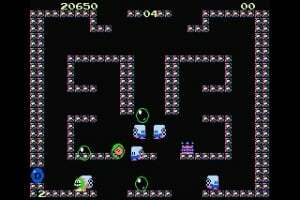 When it hit arcades in 1986 it introduced brand-new play mechanics, with players defeating enemies by trapping them in bubbles they blew and then popping them. Although it is possible to beat the game just by clearing all 100 rounds, it also contains secret elements such as a “true ending” not obtainable in single-player mode, hidden commands that lead to secret rounds and a ton of different items. These elements were one of the game’s most important selling points. Each round even has different air currents that are not visible, making bubbles rise in unpredictable patterns. 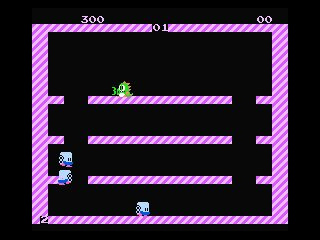 Aspects like forcing players to understand and make use of these different patterns while playing helped make Bubble Bobble a revolutionary action game at the time. I had this on the Commodore 64 and loved it. How does the NES version compare? The same with slighly better graphics? Is the NES version good? Judging by the vid it's a launch day purchase for me! Never got into this, it just felt a little too repetitive. Bring on Rainbow Islands (NES) and Parasol Stars (TG-16)! Oooh I rememebr playing this game! I've never seen a game replicate the magic this had! If you get this, grab a friend for 2 player! 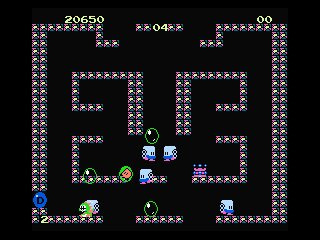 This isn't the best of conversions, so if you already have the arcade original in a Taito compilation I wouldn't be getting this one. Too bad we're not getting it this monday. Why such a long wait? Why did Nintendo cause so much anguish and bitterness amongst it`s fans waiting for this game? But joking aside, The game is awesome. It did take me forever though with my cousin to finally get the proper ending we wanted. i would not say that this is the best game ever but it was good i may buy this when it is out. 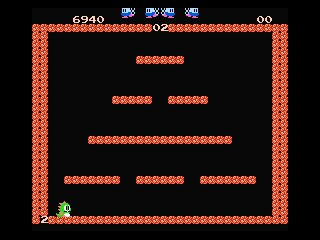 I used to play this with my mom at the arcade because it was free. Once it comes out, I'm getting this for those good ole' memories and such. One of my favorite NES games ever... I can't wait to download this! Wow. This game deserves a five-star rating. A must have! I just downloaded it and tried the "BACCF" pass, you know, the one for the 99 lives but... it doesn't work! Maybe i'm wrong? Try it! "The music is a very hummable bit of synth on a loop, it does the job nicely. The only downside is it will stick in your head for days to come!" Days? Please...ever since that game came out in the 80s anytime I see it in action or screen shots of it, or even a good deal of text that tune starts and won't quit until I distract myself elsewhere. 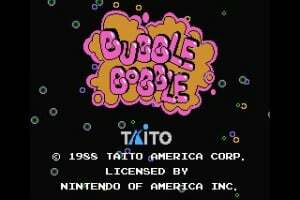 Bubble Bobble is an astoundingly good arcade and NES game and considering in the UK this came out with KOF94, due to the limit nature of its KOF year this is the good buy of the week. Isn't there better versions of this coming to VC? Like the Neo Geo one? I think it'd be much better to wait it out. 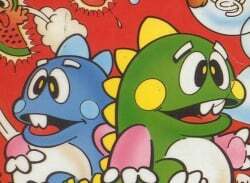 Bubble Bobble wasn't released on any other VC systems. As far as I'm aware the Neo Geo doesn't have any of the sequels/spinoffs either. Ah man, I still have this game for my NES. It's one of my favorite co-op multiplayer games ever. It's fun, addicting, and very difficult at times (Level 57!!!!!) I can't wait for this to come out here in the US. I remember this game, it was really wierd but really fun too. It is a really good game for two players. Nice co-op feature that makes it really addictive. espero que salga pronto. este juego es el mejor. i hope it's out soon. this game is the best. BEST arcade game EVER. The only reason I won't be getting it is because I already have 3 different versions, including the NES one. I had so much fun playing this with my brother at the arcade. It may seem repetitive, but so is Pac-Man and Donkey Kong and look at the success those games have garnered. Besides, you're treated with one of multiple endings after level 100. It's actually weird that I had no idea there was an NES port until I saw it here on this website, but even so, it's guarenteed to satisfy. I had this on the NES, i must of been very naive not to notice that the box was plasted with screen shots from the Arcade version. Bastards, great game though. Greatest. Game. Ever. I love this game. Seriously. SO awesome, i've been waiting forever for this to come out to VC. now bring on rainbow islands. Awesome! 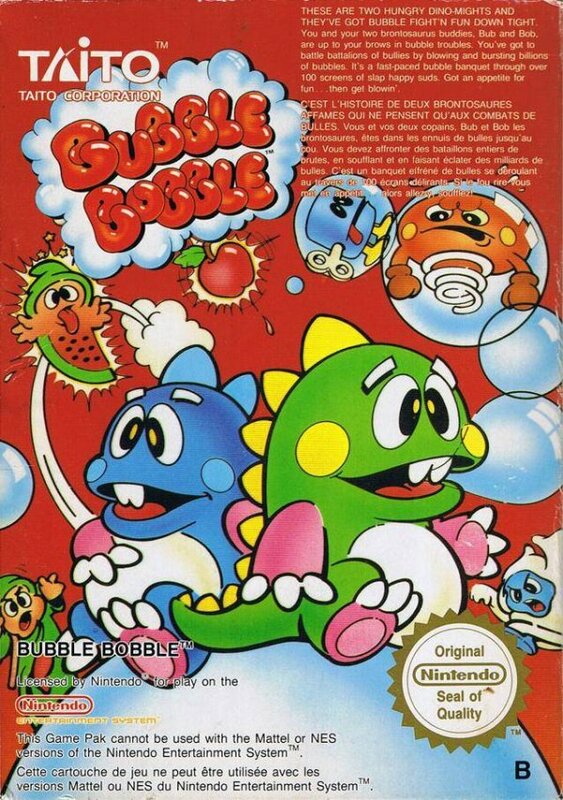 I have had so many memories of Bubble Bobble. 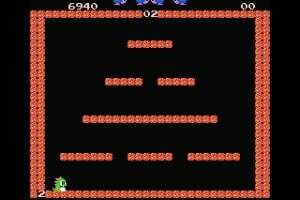 I'm sure there were several thousands of hours I spent on this game in my youth. Great, fun game. I played this one time only. Back when it came out for the Nes, a friend bought it. I played it with him the whole night, and have never forgotten it. Cute simplistic gameplay, but really fun. Definetly downloading it. Not the best version, but it's still a blast to play. THE BEST NEWS ON VIRTUAL CONSOLE THIS YEAR!!! YES!!! This is the game I've been waiting for! This and earthbound for the SNES. This brings back so many memories of me and my kindergarten boyfriend. I can't wait to download this. This game is timeless. Everyone with access to VC needs should purchase this game as one of the highlights of the 8-bit era. 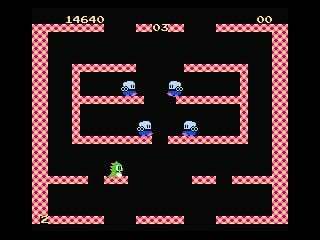 ''Bubble Bobble'' is a classic. Incredibly simple and addictive gameplay. I love it. Marathon'd this with a friend the other night. Perfect balance of action and puzzle elements. Even at the pretty tough final boss, we didn't want to stop for a second! Definitely a must-have, and a bright jewel of the 8-bit era. i just downloaded this game last night, and it is unplayable for me. I can't get past the title screen. I press all the buttons on my remote and it just stays on the title screen. Does anyone else have problems with this game? Just got this game. That theme tune is back and etched into my mind all over again. I never had the NES original, only the GB one where you couldn't see most of the map on one screen. It's great for a quick blast now and then, but probably won't do as well if played for long stretches. One of the best for the NES! brings back a lot of memories and let's face it, that is why we get these games for the Wii. The game play is fun and with 100 levels of popping the bad guys, it makes for good gaming. The NES version is fantastic. 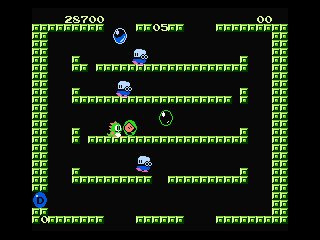 The NES sound chip makes perfect justice to the famous Bubble Bobble song, and twoplayer action never gets better than this! It´s a jolly game for one player too, but with a buddy you never get tired of finding out what kind of bonuses will rain over you in the next level. I found as well that the passwork for 99 lives doesn't work unfortunately BACCF. I hope there is another. That was the best password! I used to have this for the PS2 on the Taito Legends disc. Definitely a good game to play with your significant other. this game can't be overlooked!!!!!!!! great co-op, 100 levels, tons of variety, and at only 500 point. A must have! This is a must download for any Wii owner! I loved this game in the arcades and NES so it's great to see it back again. I hate level 57 though. Yeah well I'm getting Breath of Fire ll tomorrow, and I think I'll get this too. it's only 500 points, and the music is calling for me. Yeah I downloaded it, it's alright. I made it to level 10 with out dieing. (yeah thats bad) I can't rate it yet I have to play it more. I think it'll be an ok game. something I can go back to from time to time. But I'm gonna really try to get far. Love the game. The first use of the Wii gifting feature for me - spent an hour getting my brother's Wii and wireless router talking to each other (he's 6 hours away), then sent him Bubble Bobble as a birthday gift! Amazing how this little piece of good ol' arcade awesomeness can transform a boring sunday night into a blast of fun with a few friends, some food and maybe a little bit of alcohol mixed up . 5 stars, for sure, though I can't stand playing this by myself. But really, this game is all about fun with friends. So, if you live locked in a room all by yourself, you are better off with some other game . A must have, for 500 wii points, there's no reason not to have it! I think only Bomberman can rival it's pure fun! As I thought, this game is good for coming back to from time to time. It's fun trying to see how far I can get without getting a game over. This game is good fun. I am mad though because me and my girlfriend cannot seem to beat the final boss. 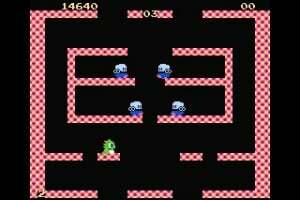 I used to play this game with my brothers and cousin way back in my childhood. Simplicity is simplicity at it's finest and that makes it awesome! 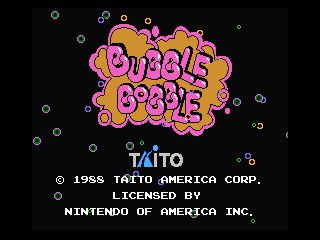 I wonder if Bubble Bobble 2 will ever see the light of day on the VC. Not too many people got to play it since it came out late during the NES's lifespan. If I were you, I would get BOTH! I bought this game out of sheer guilt. My multitude VC purchases up to now had only a shred of inclusion for my wife (such as the two-player Gunstar Heroes and Streets of Rage 2, along with Street Fighter II Turbo...I am 26, she is 21). She sorta liked those, but loses interest in the "guy" subject matter. What's more, playing any sort of "adversarial" (aka not cooperative) versus games with her of any stripe is VERY BAD NEWS - she can be a little petty! She admits to being quite competitive and gets miffed at losing, rejoices in winning, etc. So Street Fighter II quickly took a dive in average popularity around our house, for example. Cooperative two-player is the way to go with my significant other. Anyhow, I was tired of nights of feeling guilty playing alone while she watched and then slunk off to bed. Not fair, not fun. I wanted a solid two-player game we'd both be into. I bought this game instead of getting Military Madness because I knew she wouldn't take part so much in the two player aspect of that game, plus the fact that it would be adversarial. I used to have a NES and it's rhythms and visuals are burned into my soul. It just FEELS good. Same thing with Punch out - some sort of psychological comfort blanket aspect to it...I dunno. I started by playing one player which lured her in with it's cuteness and fun factor. Soon we were playing two player and were going for quite a while, up to like level 25 or so. Good pick for play with a significant other. Big thanks to the person above who suggested it as such, you saved my wife from becoming a Wiidow. Me and my sister played this on my commodore 64 back in the days. A lot of fun and a almost as much anger when we failed at level 35 or something. A must have if you have a liking for 2 player games. Wow. I thought that is games was going to be the crappiest game I ever bought. My wife suggested getting it because she loved it as a kid. So I let in, and we now play it almost everyday. WE LOVE IT!!! Awesome two player goodness and great for all ages. If you don't have it you better get it. 5 stars. Sounds fun for co-op, but all of my friends think it's gay, so I can only play single player. Still lots of fun. But this game is a game I play in short bursts. I usually only play for about 15-20 minutes. Shoemaker: You need new friends. =P I'm just joshin' ya. I suddenly appreciate that much more that all my friends are gamers. I'm not sure this game has aged so well. I used to be able to play this by myself for hours (or what seemed like hours), but now I'm not really interested except for co-op--not like single player can get "Happy End" anyway. Co-op is definitely a blast. Great music on this one, even if it gets repetitive. Not a bad conversion, but a little rough at the edges. In terms of 8-bit conversions I'd say the C64 version edges it over the NES one, but it's still great fun! Indeed I need new friends. My only friend that would actually like this game is Mr. Rodriguez. If only Nintendo alowed us to go online with this game, if only. Me and my sister used to rent this title all the time as kids, and play it together. It was a nice change of pace from the usual "wait 'till the person's next turn" 2P games the NES usually offered. It was a huge thrill for us to play at the same time. The game is a great old-school title, and offers alot of levels. A childhood favorite. I bought this because of similar warm memories of a rental one saturday back in the 80's. We played it all day and loved it (as a family actually- my brother, sister and mom all enjoyed it) and even now this is a fun co-op option for me and the wife. Not recommended for gamers who take themselves too seriously. Great game to play with a friend!! I held off on this because I've fond memories of the arcade version; but this version is ok. It has all of the game play elements, the control is fantastic and the music is good. Addictive. That pretty much sums up this classic puzzler / stradegy game. My parents used to play this night after night on the NES, and I think, if I dedicated enough time to it, I might get addicted too. I can not remember if i played it all those years ago on an Amiga or an Atari ST. But still it is one of my all time-beloved plat-formers. I remember playing it about 20 years ago (or so, i am getting old ) with a girlfriend. We had hours of fun with this first co-op-game i ever played. Now and then i am playing a few levels with this NES version and still can't get the music out of my head for hours. The 63rd (or is it 68th) level. I rented this game for my NES many years ago and loved it, but hadn't played it since. Fantastic, challenging and addictive gameplay; catchy music (even if it is repetitive! ); and what I think must be one of the toughest final bosses in video game history! I just can't seem to get into this game. This game has it all!!! I'm still waiting for more NES classic games!!! Yeah love this game its 2 players by itself but if i get online and try to play with my friend online will it work on 2 players? This is important -- THE ABILITY TO SUSPEND/SAVE THE GAME or use passwords -- in Plus, when you leave the game and come back, you (and your friends) are back at Level 1. Period. If you have a significant other or sibling or something that you want to work on this game with in short bursts of a few levels at a time over several days until you beat it, you can do that in this version, but not Plus. I've still never beaten the full original or arrange game in Plus since it takes so long and you can't save, so to some extent, I almost wish that I'd bought this instead. To some extent, I still am considering buying this NES version at some point just to be able to save/suspend the game.